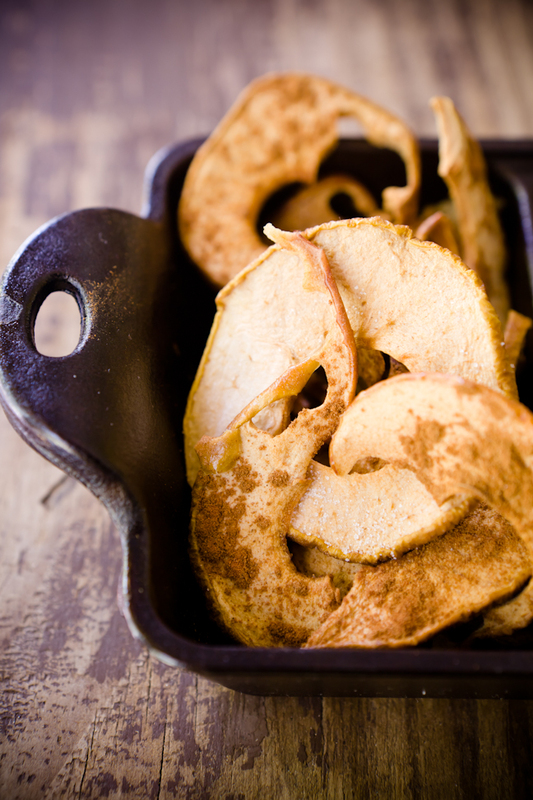 Apple chips serve as lunchbox-ready snacks that are crispy (baked – not fried) and have just a touch of cinnamon and sugar. 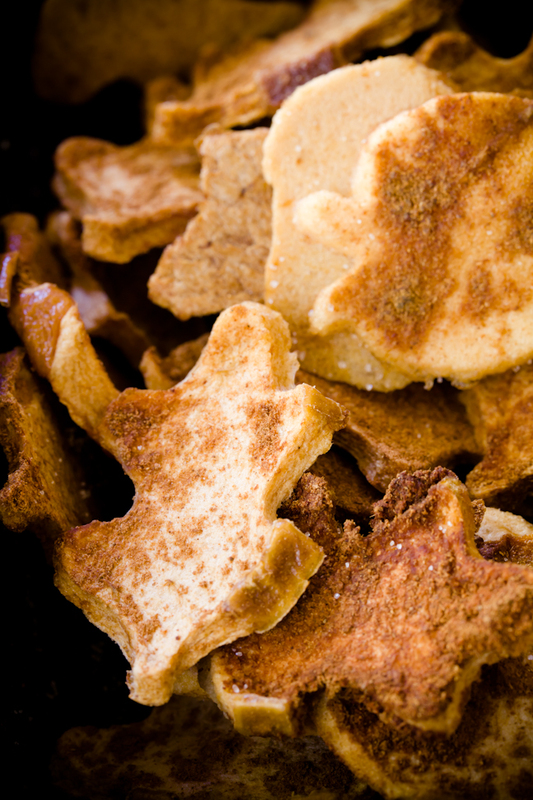 Even store-bought apple chips are wonderful treats, but when you make homemade apple chips, you can not only control how much sugar you add (you don’t need to add much), but you can also make your homemade apple chips in fun shapes! I used tiny harvest cookie cutters to cut my apple pieces into leaf and apple shapes. Using the apple cookie cutter was the literal version of the game Apples to Apples. Apple chips serve as lunchbox-ready snacks that are crispy (baked - not fried) and have just a touch of cinnamon and sugar. Even store-bought apple chips are wonderful treats, but when you make homemade apple chips, you can not only control how much sugar you add (you don't need to add much), but you can also make your homemade apple chips in fun shapes! Slice the apples. But how? Everything that I read about making homemade apple chips said to cut the slices as thinly as possible. They even recommended using a mandoline. I tried the mandoline method, but found that the apple chips were too thin. They didn't provide the same satisfying crunch as the thicker apple pieces. I also tried using an apple peeler and corer to core and slice the apples. If you've ever worked with one, you know that you end up with apple rings with a missing center, like you see in the cookie cutter photo above. The thickness was perfect. However, the ring pieces were too narrow for the apple cookie cutter (they worked splendidly with the leaf cookie cutter). In the end, I found that the best way to slice the apples is by hand with a good kitchen knife (I swear by our Wusthof). Cut the apples about 1/8" thick (if it's a bit thinner or thicker, you'll still be fine, so don't worry about breaking out your ruler). 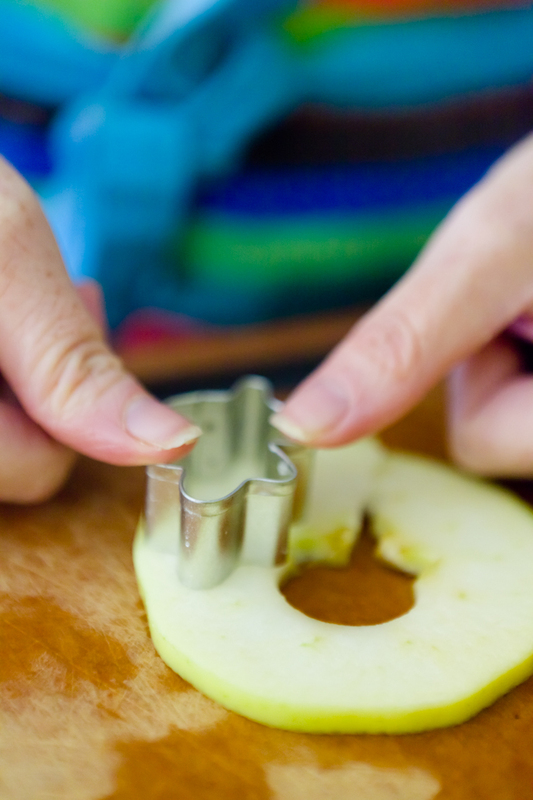 Use the cookie cutters to cut the apple slices into shapes. Don't throw out the apple scraps! They make great chips too. Line a cookie sheet with parchment paper or a Silpat and fill with the cut out apples and the scraps - making sure that nothing is overlapping. Sprinkle with cinnamon and sugar. Although I didn't try it, I think these would even be good without sugar. Most varieties of apple are naturally sweet. Load the cookie sheet(s) into the oven. The bake time of your chips will depend on how thick your apple slices are. The paper thin apple chips that I made using the mandoline took about two hours. However, the other chips took almost six hours. Check on your chips every hour or so to see how they are doing (they like visitors). You'll see them transform from the baked apple stage to the chewy dried apple stage to the crispy apple chips that you are looking for. Once they start to get crispy, remove them from the oven and flip them. Sprinkle a little bit more sugar on the flip side and bake for one more hour. Store in a paper bag or any container that is sealed but not airtight (tightly-sealed containers will make them soggy). 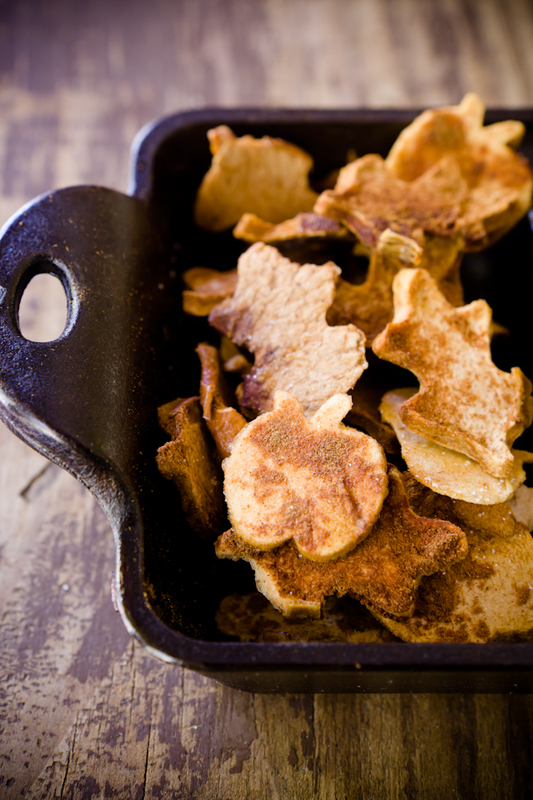 Here’s the glam shot of the apple scraps turned into apple chips. 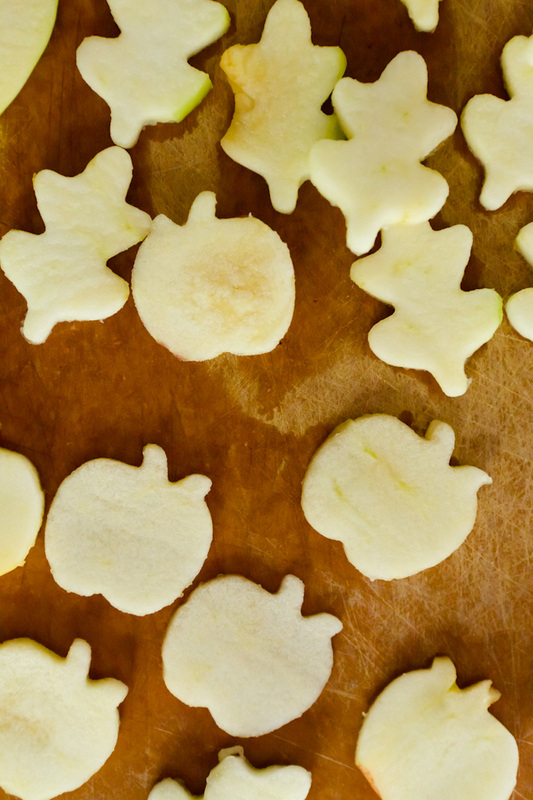 It also gives you a sense of how pretty these apple chips would look even if you didn’t use the cookie cutters at all. The apple chips also happen to look adorable on top of cupcake. Looks like a good, I like different cut very cute.I am glad you posted this. yes i like it ! its look very good ! how did you know the exact way to get me psyched for fall ? dying over here in this northeast flood zone! cannot wait to see your cupcakes! so a+ ! hmm….enak nya..dari gambarnya aja uda buat slera neh..thanks ya buat info nya..
hai..Today I got a lot of information from your article .. I hope you continue to write articles that are beneficial to us all .. .. Greetings .. success for you .. Your post its verry good, creatif, Inspiration,,succes for you..greating.. Appreciation for the good writeup. This in reality had been a new recreational profile the idea. Look difficult in order to significantly launched pleasant within you! In addition, how should we maintain a new correspondence? Hi. Previously allow me to say thanks. I’m very happy come in here. After see this site of course I know this website is useless for me and of course i hope for other too. This content give me huge trick for my based activity or my work. Next I waiting for other information. A lof of thanks for allow me comment here. I was just read your article that was really superb got much pleasure to read that post. please keep sharing post like that. thanks for share with us for this post. Thank You for reciepe. Nice Good. Friends of The Very Good Heart, I love it here. Yet another cool recipe for making apple chips. Thanks for sharing this. Is there any homemade pastry projects? apple, its look easy to make it. I like different cut very cute. I’m really happy to find this site and did enjoy reading useful articles posted here. The ideas of the author was awesome, thanks for the share.